We’ve had this planned since November, and now the day has finally come! We’re going again on our yearly excursion to the Big Apple. I took my two gals for their first time last summer, and it was so much fun! 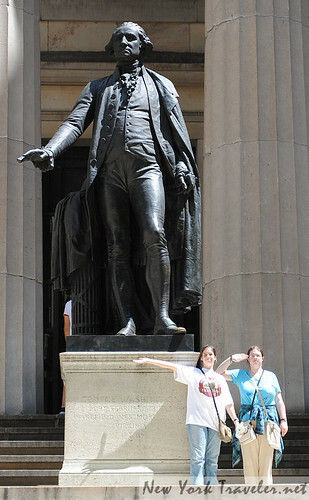 We’re continuing our whirlwind tour of Everything You Wanted to Know About Alexander Hamilton And Then Some. My eldest daughter is a Hamilton FREAK (I say she should write some books and make some millions or something!) and my youngest daughter likes to “hang” with us. The boys are now wanting to go to NYC, too, so I’ll probably be returning a couple of times this year, with them. I love NYC; I lived there for over a year as a young student. It’s so active, with so much to see and do. The place OOZES history. Some folks go for the shopping. Others go for the shows. I go for the scenery, the architecture, the history. It’s a great place. The down side is we have to get up at 4am to arrive in NYC at 9:30. And then we have to leave about 5pm to get home about 10pm. Mmmmm. P.S. If you want to get a “play by play” feed of all the action, please “Like” my Facebook page for my blog NewYorkTraveler.net. I’ll post photos and interesting anecdotes and tidbits there throughout our journey. I hope you had fun on your trip! I can’t wait to read all about it! Oh Lin, you will have a blast! Somehow, no matter where you go, you always manage to have a blast. 🙂 I really like NYC. My son is going to drag me through the USS Intrepid in the near future!